Hair accessory adds zest to a regular attire or an interesting twist to your look. Handcrafted beads and woolen threads can complete your look, as they can go with several outfits. Bow-shaped clips with laces, retro clips with check patterns or plain simple coloured clips give one trendy look. Walk on the road this winter in style! 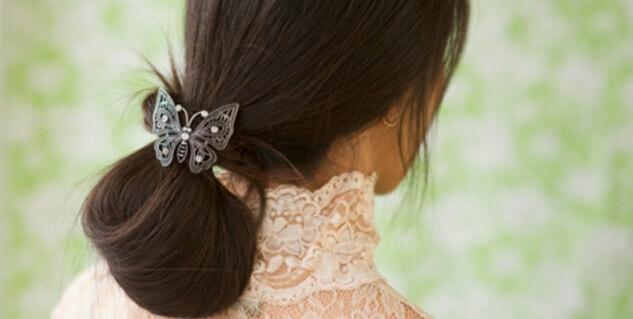 Hair accessories for girls can add the much needed zest to a boring winter attire or an interesting twist to the dress! Discover all the possible things available that you can use to adorn your hair and look stylish this winter. Wear handcrafted beads and woolen threads available in the flea markets. They are cheap buys, but look colourful if worn with black and grey pullover. Hair bands: Wear one with woolen tights and boots. Match it with your sweater or bag. Shops have a huge array of hair bands that one can choose from. Buy hair bands with a matte finish and avoid buying those that have too much bling and stones attached on them. This might ruin your look. Buy hair bands in pink, blue, black and yellow and team it up with your attire. Hair bands have been a popular hair accessory for girls since the 80s and are a beautiful way of mixing modern and the classics in your wardrobe. No matter what age group you belong to, bow-shaped clips with laces, retro clips with check patterns or plain simple coloured clips not only help your locks to stay in place, but also give your hair a sophisticated look. If you have permed hair or hair that is naturally curly, try beading them up! Put them tightly together into a pony tail with beads that can make them look interesting. Brighten up your foggy winter morning with colourful beads. Weave threads into your hair. You can choose from a million different coloured hair threads of different sizes. Suit your size and stay stylish! Here is a sure shot way of pampering your hair. Invest in a nice hair comb! This might not add value to your hair style, but will certainly make the heads turn when you brush your tresses with a comb that everybody wish they had. There are tons of foldable and wooden combs available in the market. Buy your own size, colour and quality. If you have a few extra bucks to shell out this weekend and want to look absolutely stunning, fix an appointment at your nearest hair boutique. Style it up professionally and see them embellish your hair in a serious style. Many hair professionals use hair care products for that perfect finish apart from using clips. It is time you get noticed! Choose the right look for your hair. This may depend on the quality of your hair, length and the cut of your hair. Even the right and the most stylish hair accessory can make your hair look garish. Therefore, choose your style with a lot of care. An ideal hair accessory should blend with your hair and complete the entire look. If it makes you feel out of place and is a bit unsettling for the eyes, take them off.